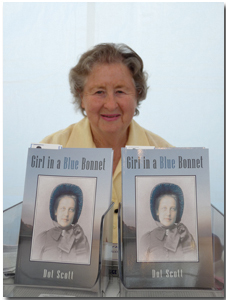 I know Dot Scott as a local writer and neighbour, so it is with particular joy that I share her motivations for self-publishing her book, Girl in a Blue Bonnet. One of the first things I learned about Dot was that she is from South Africa. That crisp precise accent gives her away. Dot lived through troubled times in South Africa as had her ancestors before her. As a young woman, she heard stories about her husband's grandmother who had to leave Mafeking along with other women and children when Baden Powell, the founder of the scouting movement defended the area against the Boers. She had shared the story in serialized form in The War Cry, the magazine of the Salvation Army, in 1975. Five years ago, family members suggested she turn that into a book. Dot didn't think there would be much appeal, but the idea that her memories needed to be passed on took hold. And she has been proven wrong. Her book has attracted unexpected readers. Dot chose to self-publish for much the same reason she decided to create a book in the first place. Time is passing. She knew that it could take time to get a book accepted by a publisher, and that time would be followed by more time to create the book and get it onto shelves. She didn't want to wait. By self-publishing, she has been able to see her books selling both in Canada and just recently in South Africa.